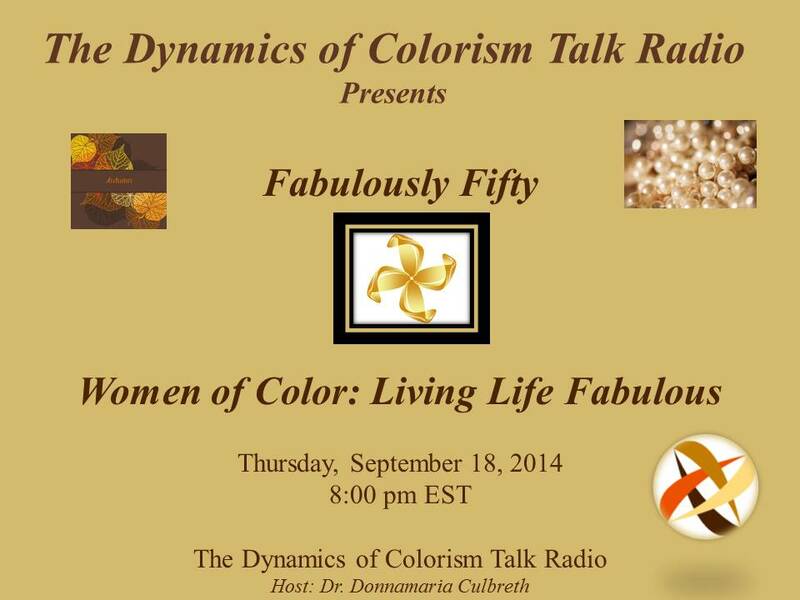 September | 2014 | The Intraracial Colorism Project, Inc.
Join Dr. Culbreth for an uplifting, invigorating, and thought-provoking talk on Fabulously Fifty: Women of Color Living Life Fabulous after 50. 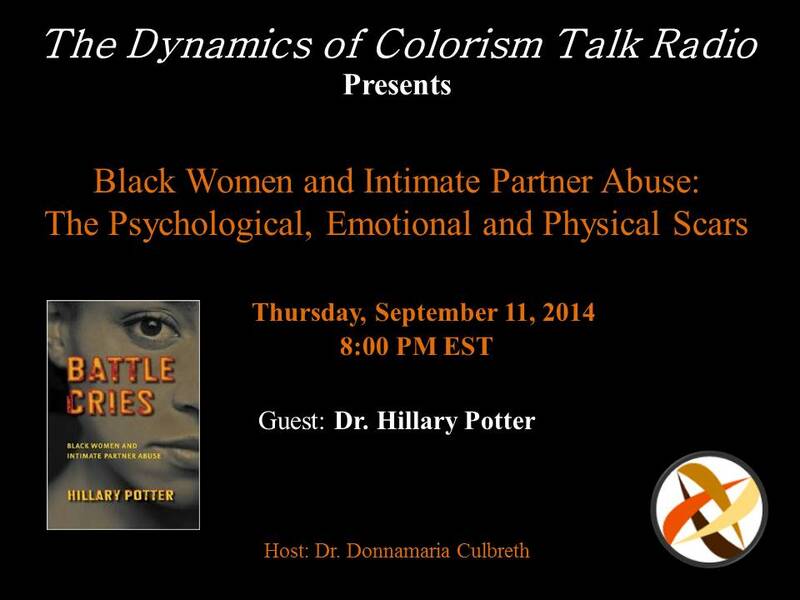 Join Dr. Culbreth and Dr. Hillary Potter for a discussion on Black Women and Intimate Partner Abuse: The Psychological, Emotional and Physical Scars. 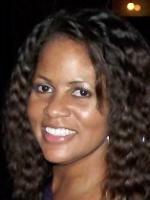 Dr. Hillary Potter is an Associate Professor of Ethnic Studies at the University of Colorado Boulder. She holds a B.A. 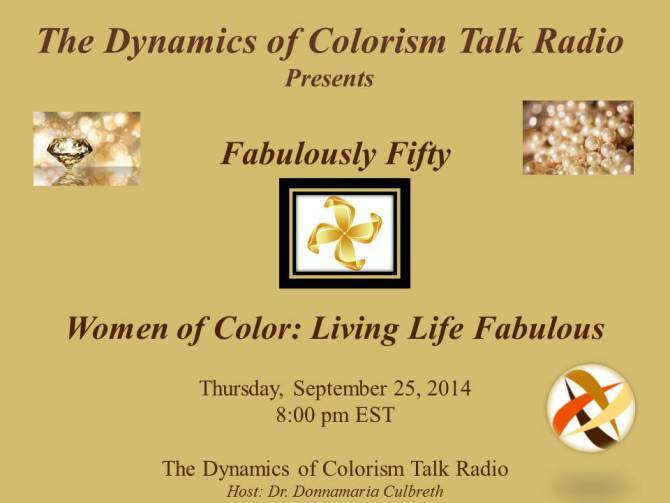 and Ph.D. in Sociology from University of Colorado, Boulder and an M.A. in Criminal Justice from the John Jay College of Criminal Justice (City University of New York). Dr. Potter’s research focuses on the critical analysis of the intersections of race, gender, and class as they relate to crime and violence (intersectional criminology). She is currently researching race, class, and targets-of-violence variations in men’s use of violence; intimate partner abuse among interracial couples; and anti-violence activism in Black and Latina communities. 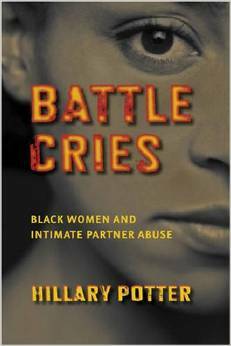 Dr. Potter is the author of Battle Cries: Black Women and Intimate Partner Abuse (New York University Press, 2008) and the editor of Racing the Storm: Racial Implications and Lessons Learned from Hurricane Katrina (Lexington Books, 2007). Dr. Potter also serves as a Commissioner with the Denver Civil Service Commission, which is responsible for administering the testing process for entry-level and promotional positions within the Denver Fire and Police Departments, policy administration, and hearing disciplinary appeals of classified members. Dr. Potter has also authored numerous articles and book chapters. She is also the author of the forthcoming book titled: Intersectionality and Criminology.